Emma in Bromley: Help Dora Help 2012 finalists - vote now! Help Dora Help 2012 finalists - vote now! You might remember I blogged about the "Help Dora Help" competition when the call for entries was open, well now there are 5 finalists and it's voting time! The closest one to Bromley is the Parkfield Children’s Centre, West Hendon, London - the London borough of Bromley has been my home for 12 years but I'm a born and bred Lancashire lass and there are TWO Lancashire finalists! Please take a moment to vote - this is a fantastic award for the wining nursery and a fantastic opportunity for the education of those children. Nick Jr., with its sister channel Nick Jr. 2, it is the most popular commercial pre-school entertainment brand in cable and satellite homes. 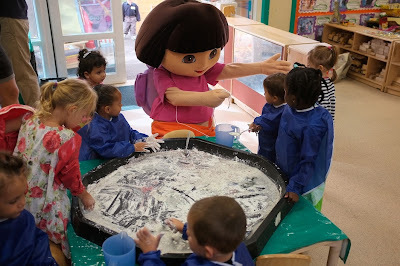 Launched in 1999 as the world's first channel dedicated to pre- school children, Nick Jr. broadcasts hit shows including Dora the Explorer, Peppa Pig, Ben and Holly’s Little Kingdom, Bubble Guppies and Olive the Ostrich. In 2009 Nick Jr. won BAFTA Children’s Channel of the Year. More information on programming as well as clips, games and exclusive downloadable content is available at nickjr.co.uk. 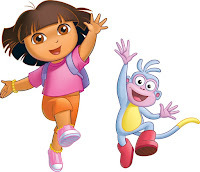 Nick Jr. is available on Sky 615, Virgin 715, through BT Vision and TalkTalk channel 318. The Prince’s Foundation for Children & the Arts is an educational charity which champions the power of the arts to transform and enrich the lives of disadvantaged children across the UK. The charity’s projects have helped to create long-term partnerships between arts organisations and their local schools. Two core programmes, Start and Quests both highlight the potential of learning outside the classroom, enabling children to visit their local cultural venue to work with professional artists, and then developing this experience through class-based projects and activities. Since 2006 the charity has worked with over 100,000 children and hopes to substantially increase this figure in the next few years. For more info please visit www.childrenandarts.org. The hunt for spiderman for preschoolers!